There is huge demand from business for green cleaning and hygiene products. Join Chemex to take advantage of a dramatically growing market while enjoying the independence of running your own business and securing a lasting, lucrative future. There really has never been a better time to become a Chemex franchisee. Eco-Friendly Products Hold The Key to Franchise Success! 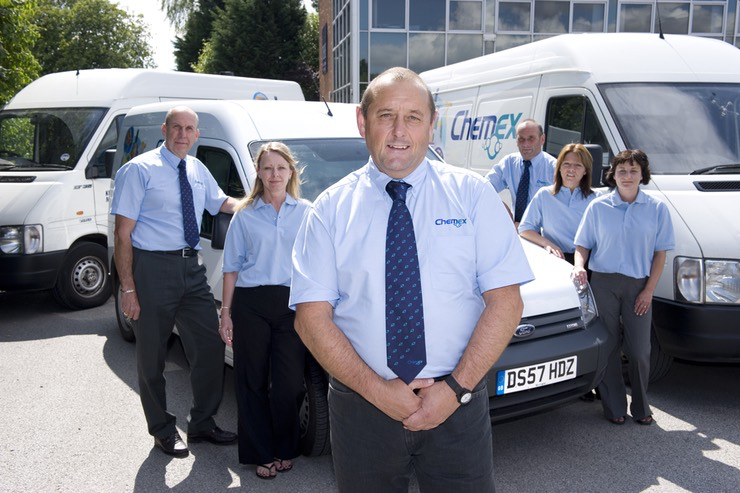 Over the last 30 years, Chemex has developed a reputation for supplying high grade cleaning and hygiene products to businesses throughout the UK. However, we are more than just simply a supplier of cleaning products – our franchisees are trusted advisors to thousands of businesses. The Chemex brand is well known and respected in the market for offering quality products and for taking an innovative approach to hygiene and cleaning. Many products in our range meet the ever-increasing demand for environmentally friendly solutions. There is a huge requirement from businesses for greener cleaning solutions, and Chemex products are designed and formulated to take advantage of this growing market. Our business model enables you to capitalise on this demand to build a long-term, profitable business. Your customers will always need cleaning and hygiene products. Over the years you will find that you acquire many loyal and regular customers who keep coming back to you time and again, providing you with a regular income. Your future earnings will depend on whether you want to operate a single or multiple van business, but each franchisee operates in a clearly defined territory where we have identified significant business potential and you will have exclusive rights in your chosen area. 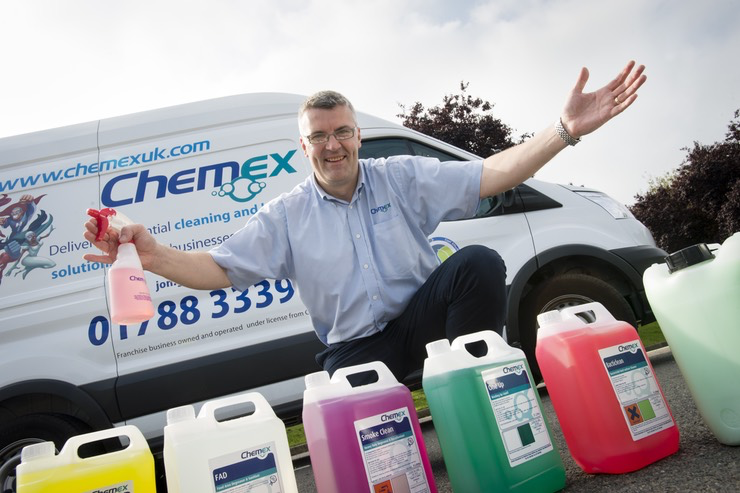 As a Chemex franchisee you will supply products and services that meet the needs of the many businesses throughout your territory that are searching for more environmentally friendly ways to operate and greener ways to carry out their cleaning. Whether this is by minimising their use of chemicals, reducing the amount of plastic waste they produce or by increasing their environmentally friendly credentials – Chemex franchisees can help. Our customers include luxury hotels, exclusive restaurants, high street stores, the emergency services and care homes, to name but a few. These are all growing sectors and you will find your best customers in these markets. 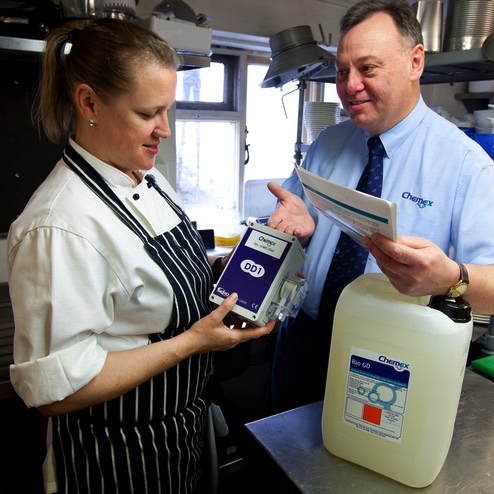 Your customers will turn to you for guidance and advice on all hygiene matters and you will become skilled at pinpointing the right solution for their needs, as well as identifying and implementing preventative measures. Choosing to join Chemex is a life changing decision but in doing so you will join one of the most stable and successful franchise businesses, that offers real opportunities for growth, profitability and satisfaction from developing your own territory. You will need to dedicate your time and effort to developing the business, but the rewards will speak for themselves. You may even decide to employ staff and run more than one van – the opportunity is limited only by your imagination. To take advantage of the outstanding opportunities offered by becoming a Chemex franchisee, you will need to invest £23,500 plus working capital and your initial stock purchase. This will give you access to all our systems, procedures and software, as well as an extensive 8-week training programme and ongoing access to our support systems and people. We also have great relationships with lenders who can advise on the best way to fund your new venture. Any business that is concerned with protecting their reputation is a potential Chemex customer and your Franchise Support Manager will work with you to help maximise the sales in your territory. One of the big advantages of joining Chemex is that your customers frequently need to re-order the products they buy from you, so you will have lots of regular clients and repeat business. Our success as a franchise business has been recognised frequently by the British Franchise Association over the years and in 2014 we were honoured with a Franchisor of the Year award. Our network benefit from comprehensive training, support and systems from our Head Office team who will guide and support you to develop your business successfully. How else do we support our franchisees? “When buying a Chemex Franchise you are taking up an opportunity to grow a business based upon your own self-employed efforts but with the additional benefit of the support provided by a well-established Franchisor as well as that of the existing Franchise network. Chemex products are not luxury items but necessities, needing to be replenished on a regular basis. Everyone needs what we sell in order to keep their own businesses running successfully but unlike the majority of our competitors we provide a unique level of service and support. Ongoing, the Chemex Franchisor provides training and support across the network in varying degrees based upon individual Franchisee needs to help you grow a successful and profitable business. Running a Chemex Franchised business is hard work, always challenging, but immensely rewarding. No two days are ever the same. You have the satisfaction of helping your customers run their own businesses to the highest standard, being compliant with ever changing legislation as well as getting to know them and their needs and establishing working relationships that last for many years.